Leema Elements DAC review | What Hi-Fi? 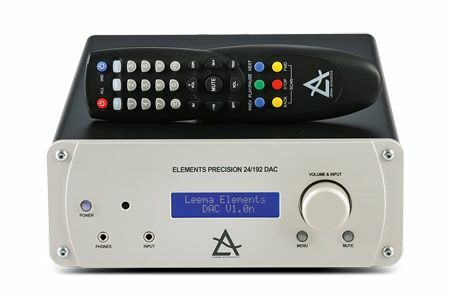 The Elements DAC is Leema’s first standalone DAC and on paper, it looks more than capable. There’s a trio of optical and coaxial digital inputs for external sources such as a CD transport, set-top box or television. There’s also an asynchronous USB Type B socket for a computer. Leema claims this provides low-jitter data transfer for optimum sound quality. Outputs include both balanced XLR and unbalanced RCA stereo sockets. The Elements DAC also features both fixed and variable volume outputs so you can use it as a pre-amplifier. In action, the DAC is hit and miss. The machined front fascia feels solid and nicely finished, although the rest of the chassis seems a little flimsy. The volume control works smoothly and is quick to respond, although the tiny buttons for power, mute and accessing the menus also feel flimsy and look out of place. Settings are fiddly to access and decipher, and the process seems to be overcomplicated. And, although buttons on the supplied remote control are well laid out and it’s easy to use, the wand doesn’t look like the sidekick for a £1000 machine. Fire up the DAC and initial impressions are positive. The Leema does a great job of projecting music, vocals especially. A quick blast of Ella Fitzgerald’s Bewitched leaves you marveling at her emotive vocals. There’s a good level of detail, especially in the sweet highs. Piano strikes display great finesse. But there’s a lack of cohesion to the music. Spin more complex tracks such as Timbaland’s Carry Out and music seems disjointed. Low frequencies lack solidity and rival DACs, such as the Audiolab M-DAC, offer greater cohesiveness and superior timing for significantly less money.